If it were up to me the world would take the month of July off. Kids get to enjoy the freedom of summer break every single year... who decided that should stop once you graduate?? Whoever you are, I'm not your biggest fan. The good part is that longer days means more time to get out and enjoy whether you're working or not. 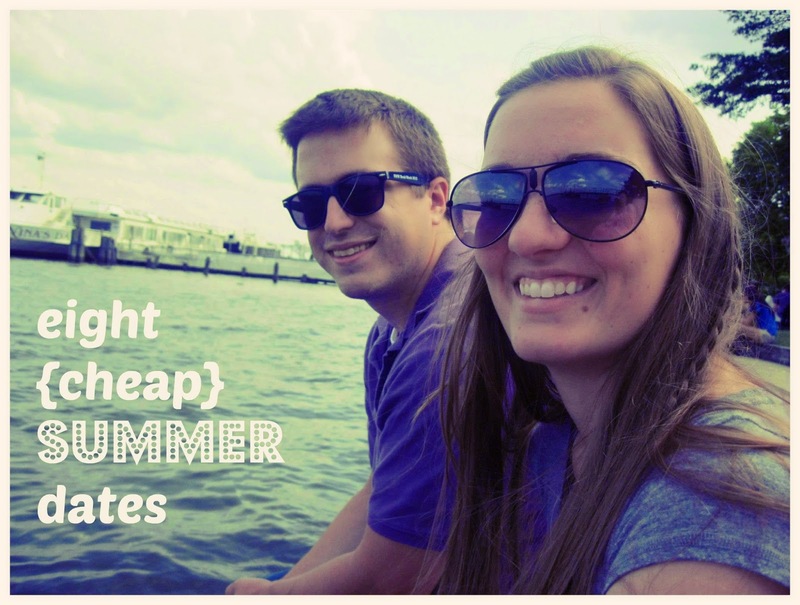 Here are eight easy, cheap dates that will make your summer a little more enjoyable. Luke and I will be taking a date a week starting this weekend... should be fun! And, believe it or not, that will just about get us through the summer. Tear. Who doesn't love re-living some part of their childhood every now and then? One of my favorite date nights was when Luke and I bought lunchables and ate them while watching favorite kids' movies. Drag extra pillows and blankets to the tv room to get comfortable. Rent an old favorite (Little Rascals) or a current favorite (Despicable Me anyone?) and relax in your extra comfy space. Don't forget sugary cereal or indulgent ice cream sundaes! I'd venture to say that most cities have outdoor movie festivals/events each summer. Check your local area for the schedule at the beginning of the summer and find the date and movie that work best. Pack a picnic, blanket and enjoy! (This post is meant for making food for other people but several of the dishes are pack-able and picnic ready). 'Tis the season of cookouts. Find three bbq sauce recipes that look good and make a small batch of each. Have a taste- test for dinner and decide on your favorite. Once you've found 'the one' make another batch or two and store for future summer cookouts or gifts. Tape a few pieces of paper together to make a long scroll (or cut out strips of card-stock or use a journal) and write out your bucket lists. Talk about all the things that you're excited to do in life and make plans! Pick three from each list and set a goal to accomplish them by the end of the year. Take a day trip to the beach... Or lake or river or other body of water. Is there a better way to spend a warm summer day?? Make sandwiches, a mix CD and pack some snacks. Bring your towels, sunscreen, cooler and book. Enjoy an early morning drive so you can beat traffic-- opt for sunrise if you're feeling especially adventurous. We live in a small apartment in a well- to- do area with lots of big houses. This means great finds at both yard sales and thrift stores :) Scour a couple of local garage/ yard sales and each find one piece that you like. Swing by the hardware store on the way home, grab whatever other supplies you want, and see who can create the best home decor. Bonus: now you have two more pieces of decor! All you need for this date is a soccer ball and some glow in the dark bracelets. Find a local elementary school or park and venture out around sunset. Use the bracelets on your wrists and on the soccer goals. Get competitive! Create a point system (points for headers, shots on goal, saves in goal, etc.) and see who earns the most points in half an hour. Loser buys slurpees! Local town squares and outdoor shopping areas often host free summer events. We love to go to the outdoor venues in the area and... you guessed it, bring a picnic. Big name concerts can get pricey but I'm of the opinion that experiences are always worth it so make tickets a birthday gift! (Plus outdoor venues generally sell lawn tickets that are cheaper and more fun).